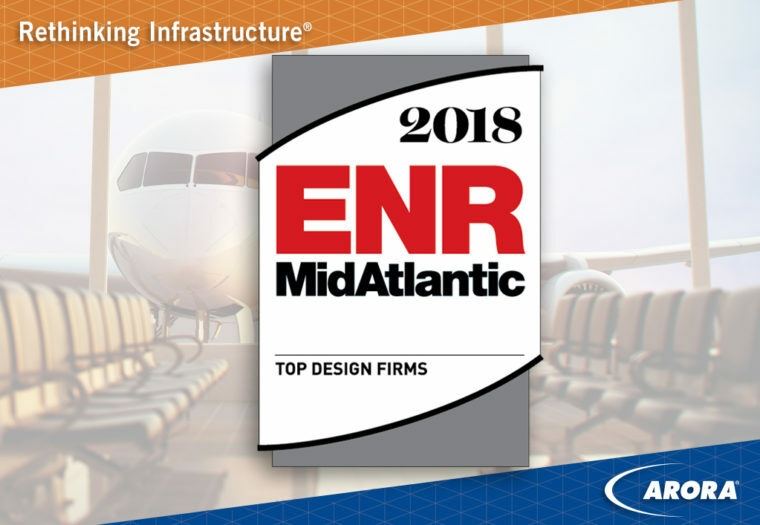 ENR Recognizes Arora on its 2018 Mid-Atlantic Top Design Firms List - Arora Engineers, Inc.
Arora is very excited and proud to be recognized by Engineering News-Record (ENR) on their 2018 Mid-Atlantic Top Design Firms list for the first time. For our inaugural list, Arora ranked #81 out of 115 design firms. The ENR top lists rank the largest U.S.-based, public and privately held firms based on annual revenue, which are then broken down into specific market categories. ENR performs these annual surveys for companies involved in general contracting, specialty contracting, engineering, architecture, planning, and studies. Engineering News-Record (ENR) provides engineering and construction news, analysis, commentary, and data for construction industry professionals. Coverage includes reports on the top design firms, architects and engineers, and the top construction companies and projects in the United States and internationally. ENR’s coverage also includes business management, design, construction methods, technology, safety, law, legislation, environment, and labor. The ENR weekly magazine has more than 47,000 paid subscribers, and their website welcomes over 196,000 unique visitors a month.